Simple to use solution combines IP sensors from HW group and IP cameras to one system. You can control your smart house from anywhere on your iPad, iPhone, Nokia or any other smart phone / tablet device. Small business usage - IP camera video & sensors integration. Security system with remote IP sensors & edhanced condition system. HSYCO HWg provides a frontend to a wide variety of device types from HW group. HSYCO HWg collects realtime data from your network connected monitoring equipment. The user interface looks and works like an app. However, HSYCO HWg is web based. Clever programming provides the same speed and user experience as if you were using a locally installed app. HSYCO HWg runs on a dedicated small web server, delivered preinstalled with a framework developed especially for the purpose of monitoring and controlling equipment from HW group. It supports most HWg IP sensors including the unique 2D water leak detection system. Many views and controls are available. You can even set sensor alert levels directly from HSYCO HWg. You do not have to access the device’s IP address to do basic configuration. HSYCO HWg also allows you to access one or more cameras connected to your network. We are presently not aware of any other solution which can combine camera access with HWg monitoring and control from the same application. HSYCO HWg is connected to the Ethernet 10/100 Mbit network. GSM modem for SMS alerting is connected to HSYCO HWg. Several IP cameras are connected to the LAN. HSYCO HWg is recording data from these IP cameras. Several IP sensor devices from HW group are connected to the LAN. HSYCO HWg is recording data from these IP sensors. The HSYCO HWg is controlled from your mobile phone (web browser) or tablet. You can control I/Os from your mobile device (smart phone). HSYCO HWg works with a wide variety of HW group products connected to your network. It's a front end to your monitoring environment, providing you with a means to view and control all monitoring devices and sensors from one single web address. HSYCO HWg is based on the HSYCO building automation solution. The HWg version is designed in a cooperation between HSYCO owners; Home Systems Consulting from Italy and Danish HWg distributor; Team Mobbis. HSYCO HWg must be ordered as a combined hardware and software solution. Specially designed web sites for data presentation, device and sensor controls, streaming video pictures and general administration comes preinstalled. Only a few administrative tasks need to be done to get started. 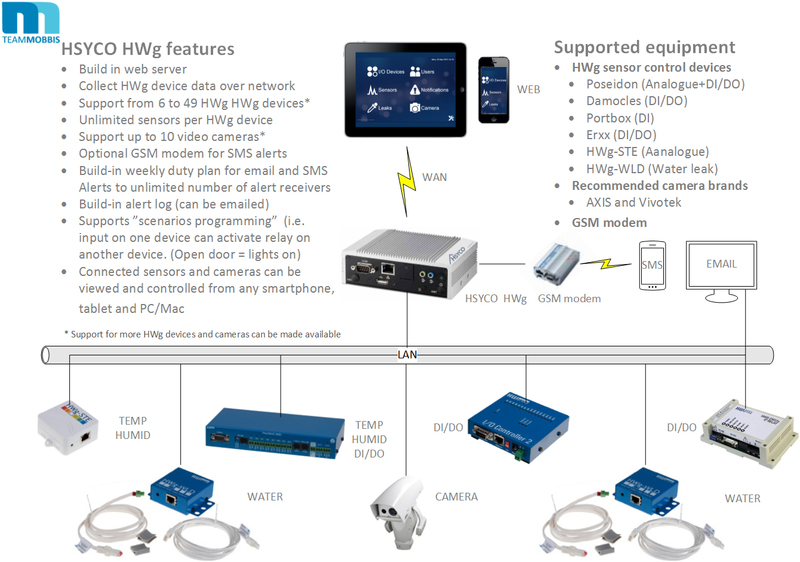 HSYCO HWg is designed to support devices from HW group. The only exceptions are the support of video surveillance cameras and a GSM modem. 2) 49 devices free of choice from the list below, plus 10 video cameras. Unlimited number of sensors can be connected to each device, dependent on the device limitation. A device with limited sensor connection for measuring of temperature and/or humidity (device version with digital in-puts). A water sensor with wire based sensor of up to 80 metres. Devices with analogue and digital inputs. More sensors than the HWg-STE. Devices with a high number of digital inputs. Comes with either relay outputs or Open Collector outputs. Devices with digital inputs and outputs. GSM/GPRS modem for SMS alerts. Surveillance cameras. Cameras from AXIS are recommended. Overview of all digital inputs and relay out-puts. An alert tic-mark can be set in order to activate an email and/or SMS text notification alert, when an input or output connection is switched on or off. When activated the con-nection name turns red. Relay outputs can be switched on and off manually i.e. turn light on. Overview of all analogue sensors. Selecting a sensor will show a graphical presentation of that sensor for the current day, the last month, or the last year. An alert tic-mark can be set in order to activate an email and/or SMS text notification when defined upper and a lower limits are reached. An alarm situation turns the sensor name red. You do not have to config-ure temperature limits in the HWg device. This can be done in HSYCO HWg too. Overview of connected water leak detectors. An alert tic-mark can be set in order to activate an email and/or SMS text notification in case of a water leak. An alarm situation turns the sensor name into red. each user. SMS alarms require a GSM modem. Hot Tip: The same user can be registered more than ones, whereby the user can be set to receive emails in the daytime and SMS texts in the nighttime. The notifications entry displays an overview of the broadcasted alerts (log). The log can be sent as email. This entry lists all connected cameras. A se-lected camera will display a live streaming image from that camera. If a connected camera supports Pan/Tilt/Zoom, buttons for these functions will automatically be made available. The tools menu gives access to an overview of all connected sensors with the ability to rename the de-vice names to more meaningful names, such as the name of the location. The tools menu also gives access to an intuitive method of logical interlinking of available inputs and outputs, so that a relay e.g. can turn on the lights when a door is opened. Specifications on supplied hardware depends on the selected license. Hardware an software are always delivered together, in order to make sure that the allowed number of supported devices in a license, comply with the delivered hardware.